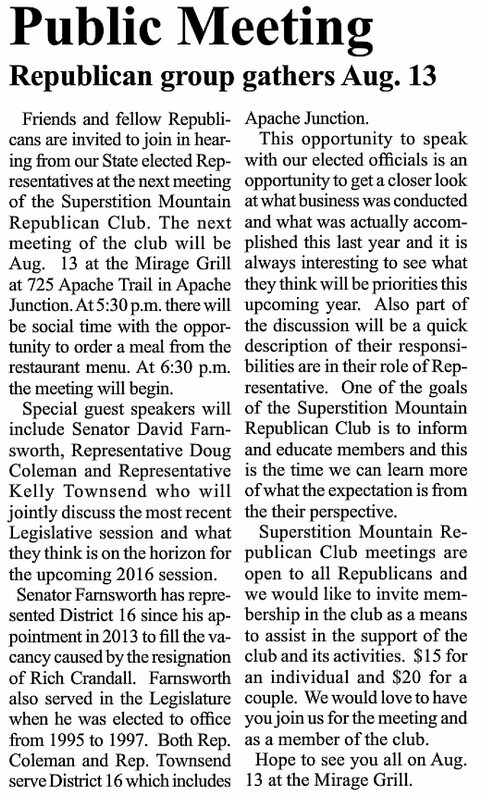 The following is a Guest Editorial by Jeff Struble, Apache Junction Businessman. The American society is very interesting when you take time to sit back and watch the different dynamics that take place. It doesn’t matter where you come from or what life experiences you have had growing up. People are generally the same. I propose the thesis that people want to be left alone to do what they want and complain about others trying to change their lives. It is just like when we were in school. The loudest kid got the attention. Then you had the prettiest girl who everyone thought they wanted to be like. And the most handsome boy who everyone wanted to be like. We all thought because of that they were our leaders. When in reality there was a few individuals who did not get much attention for their looks or loudness that actually did the work and moved things forward. They worked behind the scenes determining our problems, finding solutions and running the school. They were respected by their peers and trusted by the faculty. This is what we need to be looking for during this election year. We have some very important campaigns that are going to be taking place at all levels: city, school, county, state and federal. Without sounding to overly dramatic, maybe the most important of our lifetimes. I believe the country has been heading down the wrong path for over 100 years. That trajectory needs to change. Some say that it is too late. I disagree very strongly. That being said it will not happen overnight and will probably take more than the rest of my life. I, for one, am willing to take the first step and take the lead.It starts with our foundation, the US Constitution. It is a magnificent document that needs to be taught to each American, young and old, rich and poor, liberal and conservative. I do not believe that it is an old out of date document. I believe that it is alive, breathing and well suited to handle any issue that may arise during these “modern” times. The people need to read the actual writings of our founding fathers, not the interpretation made by others. The people need to understand the basis by which it was written. The thought process, the studying of history and the true belief in a divine inspiration.Our forefathers had only one intention, this was to create a country that people would be free to live their lives without tyrannical overlords and oppressive heavy handed leaders. They knew that the people were intelligent enough to take care of themselves. The leaders also knew that they needed to allow room in the constitution for the country to grow. They knew that there were bad things still happening in America, but they also knew that the American people would solve the issues when given the right information, time and motivation. They knew that the people will accept change when they are a part of the decision making process. During these current times, that is what is driving the people to anger and demonstration. They do not feel like they are in control of their own lives, let alone the country. On this issue I only blame the people because we have been complacent for the last one hundred years. We have been convinced that we need to be taken care of and be dependent on the government. That the solution is in someone else’s hands. That it is easier to blame someone else for our problems then to take responsibility for our own lives and the country. And the people we have put in charge are more than willing to let us go on believing just that. It is a vicious cycle. Okay, I hear you asking. What is the solution? There are three things that need to be done. First, the American citizens, and future citizens, need to want to be taught the true history of America and and why it is so important for America to remain independent from other countries. Second, the people need to elect representative, at all levels, who understand their duties and responsibilities to the people and the country. Third, the people need to revive the attitude and understanding that it is alright to be proud to be an American and that together we can accomplish anything that is put before us. This will take a true leader. Someone who will stand up and separate themselves from the pack. This means on all levels: local, county, state and federal. What do I mean by a leader? That is a person who will create, develop and promote a viable vision. The leader will take responsibility for the problems and failures. The leader will give all the praise and accolades to others when things go right. A leader provides the opportunity and resources for people to work towards the attainment of the vision. A leader does not guarantee success but shows others how to overcome the obstacles and move forward. When you read this, do you have a person that comes to mind? Is it a local person, state-wide or national? Or is it you? How are you going to move the people forward to making America great again? What can you do to start the process? Chinese philosopher Lao-tzu said,”the journey of a thousand miles begins with the first step”. You need to set a goal, develop a plan, find collaborators and move forward. You will be surprised by how many people you will find doing the same thing and looking for you to help them on their paths. Then a leader will emerge. Are you willing to take the first step? A wall of dust enveloped parts of western Pinal County and the Phoenix metropolitan area in another storm from the annual monsoon season. The dust preceded wind gusts and heavy rain in some areas late Tuesday afternoon. National Weather Service meteorologists say the city of Maricopa received almost three-quarters of an inch of rain. The storm left 1,600 Arizona Public Service Co. customers in the Casa Grande area without electricity for almost two hours. The winds knocked down an electrical wire causing outages at homes, schools and businesses within the perimeter of Kortsen Road to Florence Boulevard and Coolidge Avenue to Clements Road. Service was restored to all customers by about 5 p.m. Tuesday. In that type of situation, APS Community Affairs Manager Richard Rosales said customers should report anything to the utility company that may cause an outage. He added those tips help APS crews pinpoint the cause of an outage sooner and restore service faster. The storm also caused a semi-truck to roll on its side in the eastbound (southbound) lanes of Interstate 10 near Casa Blanca Road. No information was available on the condition of the driver, but freeway traffic was limited to one lane for hours as the truck was removed. Farther south, the storm wreaked havoc in Marana and around Tucson. Downed power lines just north of the city stranded 11 people in six vehicles for several hours at Twin Peaks and Quarry roads in Pima County. The occupants were safely removed around 4:30 p.m.
A spokesman for Northwest Fire District said the intersection was closed while power companies secured the area. The Tucson Fire Department used social media to warn residents of the dangers that storms pose, posting a video of a duplex whose windows were blasted by thunder when lightning hit a nearby palm tree. Weather experts say haboobs only occur in Arizona, Africa’s Sahara Desert and parts of the Middle East because of dry conditions or large amounts of sand. APACHE JUNCTION — This northern Pinal County city’s ground levels are sinking at the fastest rate among metro Phoenix communities experiencing the problem, a new study says. Arizona State University scientists report that some ground levels in portions of the Phoenix area are dropping at an annual rate of nearly two centimeters, or almost an inch a year. This is caused by the pumping of groundwater from subsurface aquifers, say ASU researchers. Apache Junction is seeing the fastest drop, followed by Sun City West, Peoria and the north Valley. No other Pinal County cities were studied. Although changes of a few centimeters a year may not seem substantial, when they continue for many years and over long distances they can have serious and expensive impacts, researchers say. Structures such as the Central Arizona Project and other canals, utility lines, water and gas mains, storm drains and sewers are most affected, while office buildings, apartments and homes can also become damaged as ground levels drop. Miller, a graduate student, and Professor Manoochehr Shirzaei, both of the School of Earth and Space Exploration, work with synthetic aperture radar carried on Earth-orbiting spacecraft. Such radar can measure ground elevations to less than an inch over wide areas. By repeating the measurements over time, changes can be detected, tracked and mapped. The elevation data they used for their study, which has just been published in the Journal of Geophysical Research, come from 1992-1996 and 2003-2010. “In parts of Chandler, Mesa and Scottsdale, the ground level has risen in recent years,” Miller said. “This is because we are storing the unused part of our water allotment in the ground.” But she notes that this cannot be done everywhere, and it cannot undo much of the subsidence that has previously occurred. A second long-term effect occurs, she said, when groundwater withdrawals continue: The subsidence reduces the aquifer system’s capacity to store water. PHOENIX (AP) – Much of south-central and southwestern Arizona is likely to see hotter temperatures over the next two days. The National Weather Service issued an excessive heat warning for Tuesday and Wednesday. Areas in Arizona covered by the warning stretches from Yuma and other communities along the Colorado River eastward into the Phoenix area and the Pinal County communities of Casa Grande, Coolidge and Flores. Officials say the temperature is expected to climb to between 112 and 115 degrees on both days. The warning is in effect from 11 a.m. until 8 p.m. both days. Residents who work or play outdoors face a greater risk of heat-related illness. The Weather Service is advising people to drink more water than usual, wear a hat outside and take rest breaks in air-conditioned places.